Back in the last half of the 1960's, when the world was awash in revolutionary fervor, Frank Zappa made us all think just a little bit harder by pecking little holes in our radical posturing and making music that was truly revolutionary by anyone's standards. The sixties have gone, and with it much of our bravado, but Frank Zappa has emerged as one of the truly singular artistic forces of our time. In an era of derivative assembly line studio productions, awash with strings, pablum lyrics, and un-memorable musicianship, Zappa has continued to extend the realm of that all-encompassing entity known as ''pop'' music just as he did in the 60's with such ground-breaking efforts as ABSOLUTELY FREE and HOT RATS just to name a few. A consummate "media-freak", Zappa has a background in advertising, has made movies, and lets nary a second pass without devoting it to some form of creative energy output. 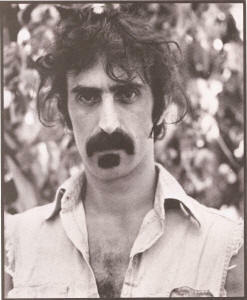 Difficult to pin down for an interview and not particularly interested in volunteering information not asked of him, Zappa disclaims the role of "oracle" – even though he's one of the first figures to come to mind when thinking about likely prospects for that nebulous profession. The interview took place in Los Angeles. TO WHAT DO YOU ATTRIBUTE YOUR RECENT COMMERCIAL SUCCESS, THAT IS THE LARGE SALES OF THE LAST ALBUM "APOSTROPHE" AND THE NEW ALBUM "ROXY AND ELSEWHERE"? Well, the last few albums seem more commercially successful, because they sold the most copies in the shortest time, but they have actually not sold the most copies. WHICH ALBUM HAS SOLD THE MOST? Freak-Out, although it is hard to account for the sales, because MGM (Zappa's first record company, and the one which put out the album) says that no records of the sales exist before 1970. We are in court with them to get our royalties. But I am quite sure that Freak-Out is platinum by now. And Hot Rats, even though it only got to number 90 on the charts for one week when it was released, has sold steadily 1500 copies a month since its release and is one of WEA's strongest selling catalogue records – it just keeps on going! BUT ON THE LAST TWO ALBUMS THERE HAS BEEN A GREATER "MASS AUDIENCE AWARENESS" THAN BEFORE. CAN YOU EXPLAIN THAT? Apostrophe had a very large advertising budget. We even did a television advertising campaign on it, with some really funny spots. And, of course, we got a great deal of airplay. BUT YOU DIDN'T SET OUT TO BE ANY DIFFERENT THAN BEFORE? No! I make the records to suit myself usually. If anybody else likes them, then well, that's good. So I guess I did something recently that more people like. SO BASICALLY, YOU CREATE YOUR MUSIC TOTALLY FROM AN ARTISTIC STANDPOINT, WITH NO CONSIDERATION OF "BUSINESS" FACTORS? Well, I keep my eye on both. Because if you leave all your business up to other people, you wind up getting in trouble. So I have people who take care of the day to day details of marketing my music, but I supervise it. YOUR COMMERCIAL SUCCESS NOW DICTATES THAT YOU PLAY IN LARGE HALLS (OVER 10,000). HOW DO YOU JUSTIFY THAT IN VIEW OF THE FACT THAT FOR YEARS YOU PLAYED IN SMALLER PLACES IN ORDER TO GET A CLOSE CONTACT WITH YOUR AUDIENCE? You lose something and you gain something by playing in a large hall. For my particular taste, recently I've come to enjoy the sound of a guitar amp turned up all the way in a concrete hockey rink. I've come to like just getting up on that stage, pumping out zillions of watts, and just doing it. It is a different sensation than before. WHICH DO YOU PREFER, BEING ON THE ROAD OR IN THE STUDIO? It's really two completely different things, and I do each one in its place. And I accomplish different things in the different environments of each situation. YOU AND THE MOTHERS WERE IN NEW YORK CITY THAT ONE WHOLE SUMMER (THE SUMMER OF 1967). CAN YOU EVER SEE YOURSELF LEAVING THE CALIFORNIA ENVIRONMENT AND GETTING BACK TO THAT TYPE OF CITY LIVING? I just didn't like it; in fact I really hated it! I was in New York for a year and a half and it was pretty grim. The first time I moved there the apartment I was in was smaller than this one room we are sitting in – paying $200 a month for a hole like that. Living under those types of conditions I don't see how most people in New York stand it. DOES IT EVER BOTHER YOU THAT THE "MUSIC BUSINESS" IS SO BUSINESS ORIENTED, AND NOT REALLY ART ORIENTED? Well,records any business is business oriented. And business exists for one reason only – profit. SO YOU DON'T DISAGREE WITH THAT? No, I prefer a society where people are motivated to make a profit than one that is completely dominated by the government. DO YOU SEE A CHANGE IN THE MUSIC BUSINESS SINCE YOU STARTED? Yes, artists are making more money now than they ever did. In the olden days, artists were getting ripped-off more than they are now, believe me. Today the percentage of artists who are managed right and can earn a decent living from their playing has greatly increased from the days when I was getting started. HOW HAS THE BAND PROGRESSED? ARE YOU STILL CHANGING MEMBERS LIKE YOU USED TO? IS THERE ANY PHILOSOPHY BEHIND DOING THAT? It is a simple philosophy – I'm not always the one who controls who is in or out of the Mothers. People come and go as they please in the band. So it follows that when somebody leaves you have to replace them; and then sometimes you don't have to replace them. IN REPLACING BAND MEMBERS, DO YOU LOOK FOR NEW TALENT, OR DO YOU SEEK ESTABLISHED MUSICIANS? I look for new people – there are plenty of them out there. I've had more than fifty people whom I have discovered in the Mothers throughout the years. DO YOU FIND THERE ARE DRAWBACKS TO HAVING A TRANSITORY BAND – HAVING MEMBERS COME AND GO? Yes. The amount of rehearsals that it takes is greatly increased by the constant transition of the group's members. I like to have things pretty snappy when I go out on stage, and that requires all the band members, new or old, to be well rehearsed. ANY COMMENTS ON THE INTERACTION OF A BAND? Well, for one thing, conflict always arises because different musicians who play different instruments have a different outlook on life from one another... Because of the different natures of instruments, take the trumpet and guitar for instance, there are two instruments that do two completely different things, and so, produce different attitudes in how their players see the music. "You are what you play!'' It is a fallacy that all musicians have the same psychological make-up. Take a person who plays a bass – who really wants to play a bass? Who wants to play the bottom notes of a song? Just think about what kind of people become bass players, and what psychological things they have to put up with – they hardly ever get to play a solo, and most of the time, in rock'n'roll, they are playing the most boring things that you can imagine. Well, that kind of consciousness is different than someone who plays an instrument that plays the melody of a song and has a lot of solos – it just is not the same head. DO YOU HAVE ANY SAY IN WHAT IS RELEASED AS A SINGLE FROM YOUR ALBUMS? Sure. I say this the single. But, saying this is the single and getting the promotion men to work it are two different things. Many times they are just very resistant to what I might have selected, and there is really nothing that I can do. So I try not to think about. it. CAN YOU SEE YOURSELF PLAYING WITH ANY OTHER "BIG NAME" ARTISTS IN THE FUTURE? Well, I have discussed collaborations with several people in the past, but they haven't panned out. IS THERE ANY REASON WHY THEY HAVEN'T? You see, big name artists also have big name managers who sit and argue with each other about everything, and by the time they get done with that, it's too late to do any work. And then of course, the record companies struggle with each other to see who will get the record from the collaborating performers – it is just one big mess before anything gets started. CAN YOU SEE A REASON WHY ALICE COOPER DIDN'T MAKE IT WHILE THEY WERE ON YOUR STRAIGHT RECORDS LABEL BACK IN 1969 AND 1970? They weren't successful then partly because of what they were doing on stage, and partly because of the fact that people who were distributing our records at that time (before the Warner distribution deal) wouldn't get on the product and promote it. Also, the group wasn't touring very much then, and hadn't gathered their glitter paraphernalia together yet, and were still developing their visual trip. The appeal of the group is just that – if you go on stage with a guillotine, and an electric chair, some chickens to murder and all that stuff, it has obviously got to be commercially successful. DO YOU STILL HAVE A RELATIONSHIP WITH COOPER? Well, I see him once in a while in a bar, and I say hello, but that's about it. There still is a lawsuit pending over the whole deal, you know. WHAT HAS TURNED OUT TO BE YOUR FAVORITE ALBUM? WHAT IS YOUR SECOND FAVORITE? I would take all the rest of them and put them on a plane way underneath Lumpy Gravy. HOW DO YOU THINK OTHER PEOPLE FORM THEIR ZAPPA FAVORITES? It is all hooked up with a subjective appreciation by a person. The feeling toward my work is based on the outsiders' personal experiences.... It's ''Memory Lane'' for most people. When a person listens to my records they hear their memories, not the record – "Oh, I was just taking my first trip, or getting laid," something like that. DO YOU FEEL THAT IS BAD? I've influenced people by virtue of the fact that a person in my audience at some time has had an insecurity or doubt that has been resolved by the fact that a certain type of music was available at a certain time to reinforce his or her feelings of being right and quelling his or her insecurities. I've got tons of letters from people who say that because this or that album was there it helped them with their life in one way or another... When our records came along during the great upheaval of the 1960's, with many people forging ahead into the unknown and floundering, they didn't listen to Mothers' albums as music or even art. What they heard was some lyric ideas which would reinforce their social position and give them something to cling to. And that seems to be the case with most of the early fans – they didn't hear us as music at all, they heard us as therapy! That's the way it was, and I am happy to have provided that therapy. I intended that therapy in writing some of those lyrics then. HOW DO THE IDEAS COME ABOUT FOR YOUR SONGS – DO THEY ALWAYS COME AS A LYRIC IDEA FIRST? Not always. A lot of the time I write a complex melody, and then later, as much as two years in some cases, I sit down and say ''Can I write lyrics to this?" CAN YOU WRITE SONGS ON DEMAND? Yes, I can. Actually, that is the way I have to do it. If I know I have a job to do, like getting the songs ready to cut an album, I go out and do it. WILL YOU WRITE A HIT? It all depends on what you call a hit... Writing one and producing the song that gets on the AM radio are two different things. YOUR PRODUCTIONS ARE SOME OF THE BEST AROUND. WHAT WOULD BE THE PROBLEM? I'm not saying that I couldn't produce it; I'm saying that a record with my name on it as artist or producer, instead of just writing for someone else, wouldn't get on the AM radio. IS THAT BECAUSE PEOPLE IN AM RADIO DON'T LIKE YOUR IMAGE? YOU THINK THAT STILL EXISTS TODAY? It's dwindling, but it is still there. AT ONE TIME MOST RADIO PEOPLE, ESPECIALLY IN AM, WERE VIOLENTLY OPPOSED TO WHAT YOU WERE DOING, CORRECT? Yes, violent would be the word. DID YOU ENCOUNTER IT PERSONALLY? Well, I never hung around with radio people, and let them heap abuse on me, but it is obvious now that when I go to an AM station the response is very weird. They really even hate to shake hands with me. There is nothing worse than a fake "AM handshake''. You know, from those guys with the peace medallions around their necks in 1974. WHY DO YOU THINK THAT THE AM RADIO TOP 40 FORMAT STILL HAS SUCH POWER? They have power because, that's the business, that's the way it is. WHO DO YOU THINK IS LISTENING TO THEM? Millions of people, millions of people without FM radios. Now if they had FM radios all they would hear was an FM version of what the AM stations are doing. People who want pure entertainment! They don't want anything but entertainment. They don't even consider the ''instead of''. They want entertainment "no hassles, get me off!''. I feel that the younger kids coming up now are in better shape than their older brothers and sisters. Because their older brothers and sisters were on the frontier of a new discovery, and there were a lot of casualties along the way, most was a result of the use of psychedelic drugs. The young ones today may be obliterated on downs, but there is still hope for them. I would not be so optimistic about some of their older brothers and sisters. THERE WERE A LOT OF CASUALTIES, BUT THE PEOPLE WHO MADE IT THROUGH SEEM TO BE VERY ENLIGHTENED ABOUT WHAT THEY HAVE TO DO IN THE REAL WORLD. I don't buy that! I wouldn't minimize the statement "There were a lot of casualties" – there were millions of casualties! Some of them may be running things in society, and some of them may have dropped out. The rest of them are just in the median strata of society and will produce psychologically damaged children. The younger kids had the opportunity to watch their older brothers and sisters make mistakes and were repelled and turned off by those mistakes, and therefore many will take the "reactionary" course. ARE THE YOUNGER KIDS MUCH STRAIGHTER? WHAT KIND OF MUSIC DO YOU LISTEN TO HERE AT HOME? Recently I have been researching current pop music – the stuff that I had been studiously avoiding for years. I am not a pop music consumer, but I sent a guy from the office to buy all the latest crap, and after listening I will try to make some assumptions about what is going on. WHAT KIND OF POP MUSIC? Well, I got four Black Sabbath records, two Z.Z. Top records, six Kool and the Gang albums, Robin Trower, Rory Gallagher, Uriah Heep, Mott the Hoople, the Blue Oyster Cult, Wishbone Ash ... We shall see. Yeah, I find that I dislike most of it. Now I am looking to see what I find is wrong with it. By my point of view most of it is mediocre, dull, and uncreative, besides being poorly played. I didn't hear any good guitar licks, any good vocals, I didn't hear a tight rhythm section – I heard fuzz tone. I can dig fuzz tone, but not as a cover-up for the lack of other things. SO WHY DOES IT SELL? Probably for just those reasons. Obviously, people are into just those things, or the lack of them. I just don't understand it, but I will. WHO DO YOU FEEL INFLUENCED YOU MOST OVER THE YEARS? There is a complete list on the inside of the Freak-Out album, and that still stands. DO YOU FORESEE A TIME WHERE YOU WON'T WANT TO DO INTERVIEWS ANYMORE AND BECOME ALOOF FROM YOUR FANS? No, there is only one time I ever refused interviews, and that is the nine months I was in a wheel chair. WHAT WAS THAT INJURY FROM? That is when that guy in England attacked me and pushed me off the stage. I just didn't feel like being interviewed in the state of physical wreckage, and so I just dummied up for that period. YOU NEVER VOLUNTEER A COMMENT ON ANYTHING. WHY IS THAT? 'Cause I'm not a philosopher or an oracle. BUT YOU HAVE INFLUENCED MANY PEOPLE? 1. This is one of the first interviews made by John David Kalodner. Concert magazine, October 1973: At 23 John is one of the youngest music journalists in the country. He has done photography for groups like Chicago, worked for a record company, and has been with Concert Magazine since its inception.